Global demand for ICE and related filters will expand 4.7 percent per year to $34.0 billion in 2020. The US was still the largest national market for ICE filters in 2015, but China will surpass the US by 2025. The motor vehicle market accounted for nearly three-fourths of all ICE filter sales in 2015 and will remain the dominant market through 2020. This Freedonia study analyzes the $27.0 billion global ICE and related filter market. It presents historical demand and shipment data through 2015 plus forecasts (2020 and 2025) for supply and demand, as well as demand by type and market, in 6 regions and 22 countries. This study also analyzes the market environment, evaluates company market share and profiles industry competitors worldwide including DENSO, Donaldson, MAHLE International, MANN+HUMMEL, and NGK Insulators. 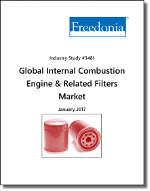 This study analyzes the world market for internal combustion engine and related filters. The major product types are oil, air intake, fuel, and other. Included within the other category are cabin air filters and diesel particulate filters, as well as smaller market products such as brake fluid filters, transmission fluid filters, and engine coolant filters. In the case of diesel particulate filters, demand in this study refers to the uncoated filter substrate (or filter core), not the entire filter system. Membranes are excluded from the scope of this study. Demand is segmented into three markets: motor vehicles, other transportation equipment (locomotives, motorcycles, snowmobiles, etc. ), and off-highway and other equipment (other includes various stationary internal combustion engine-containing equipment, such as generators). Air and fluid filters are covered in Freedonia Group Study #3443 Global Air & Fluid Filters Market.